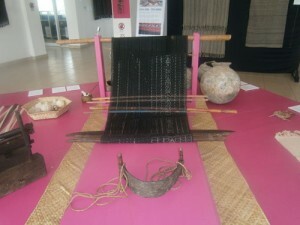 Tourism for women’s economic empowerment and cultural preservation. Fundasaun Alola and Timor Adventures have recently completed an important research project exploring the potential for cultural tourism in the Districts of Bobonaro, Ainaro and Lautem. Fundasaun Alola and Timor Adventures have been collaborating for some time, looking for opportunities to develop tourism initiatives, aiming for economic empowerment for women while preserving traditional culture. The project was part of a broader study being conducted by the International Labour Organisation and has provided an excellent basis for future sustainable tourism initiatives. The project had very short time lines and required field trips to each of the three Districts during the wet season. Due to road and weather conditions it was not possible to visit all potential destinations, despite this, the research was comprehensive, a total of 13 Sub Districts out of a possible 15, were visited. District and Sub District Administrators, Xefi de Sucos, (village leaders), Lia Nains (traditional leaders) and others engaged in tourism related activities were interviewed; two focus groups and one workshop were conducted. In addition a literature review was completed, looking at models for cultural tourism and experiences in other countries. Input was also sought from National Government stakeholders engaged in culture and tourism. What traditional cultural elements of lifestyle, beliefs, activities and norms are unique and of potential value for community based tourism initiatives? What significant historical sites relating to Portuguese, WW2 and Indonesian occupation and the resistance struggle are of potential value for community based tourism initiatives? What do key stakeholders from the communities of the three Districts under investigation think about the concept of tourism? What are the potential social risks and benefits to the community? The results from the research are very encouraging. Those interviewed whilst aware of the challenges, expressed real optimism, about the potential benefits of cultural tourism for their communities. 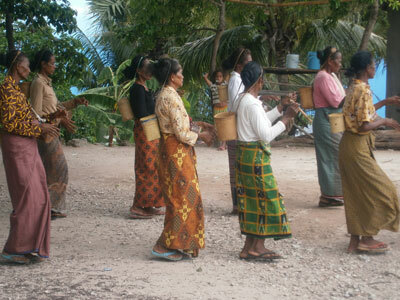 In particular women’s groups, including those that Alola currently supports and others such as OHM in Bobonaro District and Hanion Ba Oin in Ainaro District, are very keen to try tourism initiatives. Of course there is much work to be done; infrastructure including road access needs to be improved. With the benefit of experience from other countries it is clear that a tension exists between the economic benefits of tourism and the potential risks to traditional culture. It is essential that careful consideration is given to the model that is chosen to introduce cultural tourism into Timor-Leste. It seems likely that the best way forward will be a collaborative approach, with input from the communities, government and non-government sectors, private entrepreneurs and tourism operators. Establishing a community based tourism network is felt to be a useful way to ensure this collaboration. Fundasaun Alola and Timor Adventures would like to thank the ILO for their funding and support for this project, and look forward to continuing to work together to further economic empowerment for women and to preserve traditional culture. 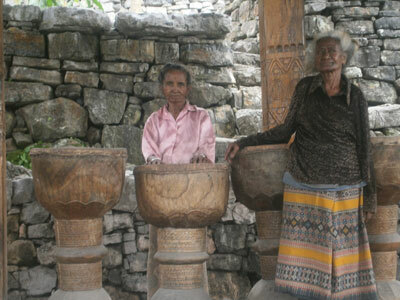 This report on the potential for Cultural Tourism in Timor Leste was amazing! So refreshing to hear local Timorese voicing their real and well-considered thoughts and hopes for tourism development in TL. The unique, priceless attractions of the 3 Districts discussed in the Report, and their connection and meaning to the people , well and appropriately managed at a local level, constitute an amazing, sustainable asset for TL now and into the future . I do hope that this report and others like it, result in Government funding and implementation. I really believe that Timor Leste could have the most amazing, authentic, untarnished tourism experience for visitors and locals alike and lead the world in Cultural Tourism from the grass roots up. Well done Timor Adventures , the Alola Foundation and the beautiful people of Timor Leste!